Every year as I approach Thanksgiving, I am struck by the correlation of personality types to pie selections. Last year I published on MMM my Pie Personality Test 1.0. 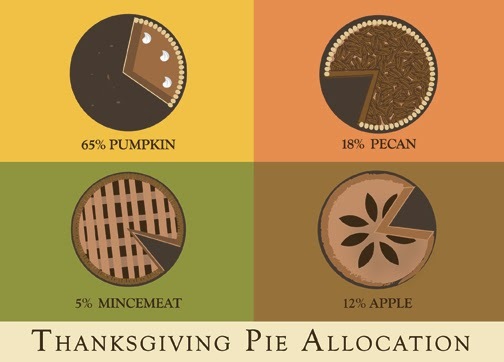 I received generally positive feedback, but also received several requests for other types of pie not represented. So with Thanksgiving approaching, I submit Pie Personality Test 2.0 for your reading pleasure. You're the perfect combo of comforting and traditional. You prefer things the way you've always known them. You'll admit that you're old fashioned, and you don't see anything wrong with that. Your tastes and preferences are classic. And classic never goes out of style. Those who like you crave security. People can rely on you to be true to yourself - and true to them. You're loyal, trustworthy, and comfortable in your own skin. And because of these qualities, you've definitely earned a lot of respect. You're the perfect combo of uniqueness and quality. You're able to relate to many types of people with many different tastes. But you're by no means generic or ordinary. In fact, you're one of the most original people around. You tend confuse people when they first meet you. But you're not as complicated as you seem. Even though you have a lot of spice and flavor to you, you're never overpowering. You are a calm and comforting force in people's lives. You're the perfect combo of simplicity and divinity. You are a secret hedonist. No one knows how indulgent you can be. You don't indulge often, but when you do, you go for the best. You have expensive taste - even if you aren't rich. Those who like you live for understated pleasures. You're not flashy or trendy, but you have a depth that most people lack. Interacting with you makes most people feel incredibly satisfied. You are gentle, super sweet, and in harmony with those around you. You're the perfect combo of innocent and romantic. At times, you seem a bit naive, simple, and innocent. But at second glance, you are sensual, seductive, and even a little naughty. You have people fooled - at least you'd like to think so. Those who like you enjoy a contradiction. Either that, or they can't really make up their minds about what they want. And you can usually give people what they want... though you prefer to tease. You've been known to be quite tempestuous, and pleasing others is not high on your list of priorities. You're the perfect combo of flavor and depth. You are overpowering and dominant - and that's what people like about you. You bring energy and a new direction to most interactions. People crave you in a serious way. You're that important to them. Those who like you give into their impulses. You don't represent reason. You represent pure temptation. People get addicted to you rather easily. You offer people a tart and tangy side that is very hard to resist. You're the perfect combo of culture and tradition. You are polite, well mannered, and a great listener – comfortable in society. You bring knowledge and perspective to your interactions. People admire you in a serious way, and can be intimidated by your presence, yet softened by your demeanor. Those who like you act comfortably, casually, yet intellectually. You are classy and articulate, thoughtful and introspective. People like you for a while, but will go looking for something more fun eventually. While emanating culture, class, and knowledge to others, you are most impressed with yourself, and secretly annoyed by others. You're the perfect combo of substance and zest. You are creative and sarcastic beneath the surface, you love inside jokes. You are tranquil and serene on the outside, smiling and sweet to everyone. You can be clingy in relationships – though extended commitment scares you. Those who like you generally open up and share without reservation. You're popular and well liked, a fact that makes you happy, yet you don’t seek. Interacting with you creates dependencies on you from others. Where you are found, tears, laughter, and sweet memories exist. You're the perfect combo of mystery and lavish. You are a perfectionist relating to quality, nothing is “over the top” when you plan. You are fashionable and stylish, yet others are kept guessing what is your “look”. Your relationships are silky smooth – you spoil those closest to you. Those who like you feel like they know everything about you, even though they really don’t. You're the great communicator who loves to blog, facebook, and tweet, yet deep down you see yourself as mysterious. Interacting with you can be described as audacious and rich, especially if it’s at an event you have planned. You’re craved by people who feel bland in their lives, yet they view you as sporadic adventure that creates temporary nirvana. You're the perfect combo of zesty and naïve. You are witty and sarcastic, and you’re well known for giving “zingers” that put people in their place. Your eyes and your smile don’t always seem congruent, there is an implied meaning in everything that you say, though you say it with a smile and seeming innocence. Your relationships are mercurial – they change by the day and by the minute. Those who like you are required to give you the benefit of the doubt, and they ride the good times through the inevitable rough patches. You're the great comedian, everyone wonders how you come up with your jokes and get away with what you say. Interacting with you can be described as superficial and fun, though through your interactions those around you experience high highs and low lows through your turgid mannerisms. You’re craved by people who are seeking their identity, yet they view you as their ticket to popularity and social elitism. You're the perfect combo of sunshine and rain. You are happy and bubbly, and stress is more likely to make you giggle than cry. You are active and outdoorsy, but in settings that are more likely to be filled with flowers and butterflies than dirt and sweat. You can be aloof and trepidacious in relationships – mostly because you deeply fear hurting anyone or anything. Those who like you include everyone with a pulse, though cynics and malcontents are cautious around you. You're not the most popular or visible in a group, though people gravitate to your sincerity and wisdom. You’re very concerned with those who are shy, left out, or insecure, you at one point were one of them. Interacting with you creates deep and lasting friendships, and consolation for anyone that hurts. Where you are found people feel the warmth of sunshine, and the freshness of rain. You're the perfect combo of perplexity and nostalgic. You are sentimental and conventional, and traditions and symbolism reach almost religious levels of zeal for you. You are intelligent and smart, but in a demurring and cryptic way that makes you seem like a fantasy character. You can be private in relationships– you love the quiet of solitude, though those you connect with share your penchant for mystery and flair. Those who like you are more curious about the labyrinth of your life, and think they can figure you out. You're an enigma, and far more genuine and simple than people suspect. Interacting with you creates philosophical questions, ethical debates, and introspection and soul searching. Where you are found life is filled with charades, cryptograms, and riddles.